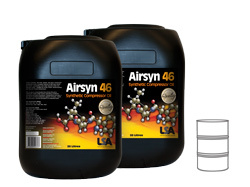 Synthetic Zinc Free, ashless, anti-wear Compressor Oils blended from a complex mixture of PAO base stocks and esters possessing a very high viscosity index and low pour point. They are suited to the requirements of a fluid operating under extremes of pressure, temperature and load. Recommended for Atlas Copco rotary screw compressors and extends oil change intervals, reducing servicing costs to a minimum. Recommended for oil lubricated air compressors including Rotary Screw, Reciprocating and certain types of Rotary Vane Compressors, where higher temperatures and operating pressures exist. Suitable for all compressors commonly operating on mineral oil.